When Lulu's classmate, Emma, decides she no longer wants her hamster, Ratty, she gives him to Lulu, who happily takes him in. Just as Lulu and her cousin Mellie get Ratty trained, however, they are invited to spend the weekend with their Nan, who is having a birthday. Convinced that Ratty should not be left alone, they decide to sneak him away with them, even though Nan is terrified of hamsters. Keeping Ratty hidden proves more difficult than expected, however, when Nan's dogs take an interest in him, and then, by accident, he escapes! It is pretty clear by now that Hilary McKay can make a compelling story out of anything that happens to Lulu and her family and friends. 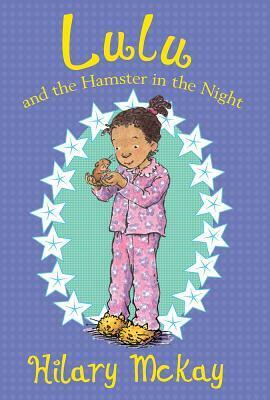 While the plot of this book does not necessarily bring anything new to the stereotypical "lost hamster" storyline, it is exceedingly well-written, and perfectly captures Lulu's ongoing struggle between getting animals out of trouble and getting herself into it. As other titles in the series have done, this one also really celebrates the warm, loving relationship Lulu and Mellie have with their grandmother, and the patience of the adults in Lulu's life for her strong interest in caring for animals. The penguins finished. A new show started about criminal minds. "No, thank you!" said Nan. "No criminal minds here!" And she switched off the TV so that the screen became blank except for Mellie's reflection. Fans of the series will be glad to discover this sixth installment about Lulu.